Bring the kids along to Arboretum Lussich and Playa Solanas. Step off the beaten path and head to Mirador Punta Ballena and Bouza Bodega Boutique. Explore Montevideo's surroundings by going to San Jose de Mayo (Espacio Cultural, Teatro Maccio, & more), Piriapolis (Playa Punta Colorada, Rambla de Piriapolis, & more) and Costa Azul (Playa Costa Azul Canelones & Costaventura). The adventure continues: make a trip to Plaza Independencia, hunt for treasures at Mercado del Puerto, take a stroll through Ciudad Vieja, and admire the masterpieces at Museo - Taller de Casapueblo. Plan my Montevideo trip by asking Inpirock to come up with tips and suggestions. If you are flying in from Brazil, the closest major airports are Carrasco International /General C L Berisso Airport, Capitan Corbeta CA Curbelo International Airport and Laguna de Los Patos International Airport. 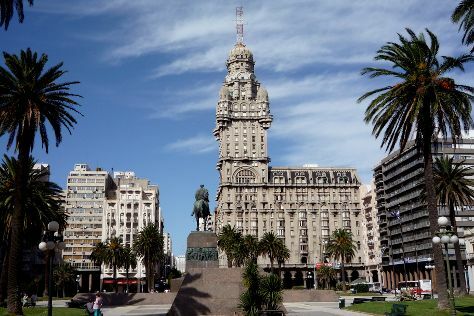 June in Montevideo sees daily highs of 19°C and lows of 7°C at night. Wrap up your sightseeing on the 30th (Sun) early enough to travel back home.